This stuff smells amazing! But the best part is that it sinks into your dry hands leaving them moisturized and not a trace of greasiness. It’s not listed on her website, but you can ask for it. It’s sold in a small tub for $3. A few months ago I went for a hair cut and colour. My colourist suggested I try dry shampoo because if you wash your hair less, you keep your colour longer. I tried this product and loved it! The smell is wonderful and it zaps the oil from my scalp so well that I get two extra days of not washing my hair. It’s $30 for 5.25 oz. Living in Canada I get really dry hands in the winter. Luckily I found an awesome solution to my dilemma. Using this kit once a week my dry hands are a distant memory. This package contains a scrub, hand lotion, and more emollient hand softener for $51. If you’re not into the peach scent, it also comes in unscented. I’m not into a lot of scented things, but this peach smell is amazing and reminds me of a summer day which will also help get me through the long winter ahead. I expect a lot from my mascara. It must not cost much, dry quickly, add volume, and have no clumps, flaking, or stupid oversized brush. Enter CoverGirl Lash Perfection. It lives up to my mascara expectations and I don’t leave home without it. It costs anywhere from $5-$7. No, I’m not talking about tiny brushes for magical critters. I’m speaking of the line of inexpensive brushes made by a company called e.l.f. (it stands for eyes, lips, face). I can’t review all of them but the three I own are wonderful. I use the e.l.f. Essential Eye Shadow Brush for eye shadow, e.l.f. Essential Eyelash & Brow Wand to brush my lashes, and e.l.f. Essential Defining Eye Brush to fill in my brows. At $1 each what are you waiting for? Hope my reviews help you! 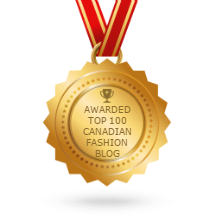 Don’t forget to vote for us for best fashion blog in Canada here. Make sure to click on the blue vote for us button NOT the facebook like icon. It only takes a second and you don’t need to register. Thanks for the love! Previous: Tuesday’s OOTW – Man Up! Yeah, it’s my total fav mascara at the moment. Companies seem to sense when I love their mascara and then discontinue it. *sigh* Yes do try the dry shampoo. The kind I listed is the only kind I’ve tried so far, but I’m sure there are some decent options at the drugstore.